Also Available With PFA Insulated Cables (260ºC Maximum Temperature), Fiberglass Cables (GG) and Fiberglass Cables With SST Overbraid (-SB). Fiberglass Cables have 500ºC Maximum Temperature, See Individual Product Sheets. These RTD sensors contain 100 ohm, Class B DIN Platinum thin film RTD elements with fiberglass insulated and jacketed cables and transition fittings with strain relief springs. This -BX model also includes stainless steel BX-style flexible hose from the transition fitting to within 6 inches from the end of the cable for protection in high traffic areas. . Metric:To order probes in intermediate lengths (50 mm minimum, change length in model number and use next longer price. 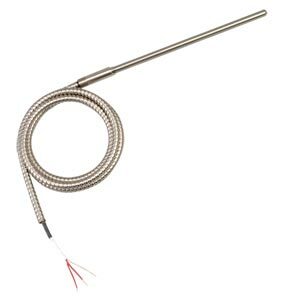 For probe lengths over 600 mm, change length in model number add $1 per 25 mm of probe length. Cable length refers to length of metal hose with cable extending 150 mm minimum from end of metal hose. For metal hose lengths longer than 1 meter, add length to end of the model number and add $7.50 per meter.